Action cameras that record your outdoor adventures have been letting us all share in the adrenaline rush for years now, but they have one annoying flaw: they only show one side of the action. You can either see the operator’s face or the scenery around them, but never both. The CENTR camera is an action cam that lets you record everything all at once. 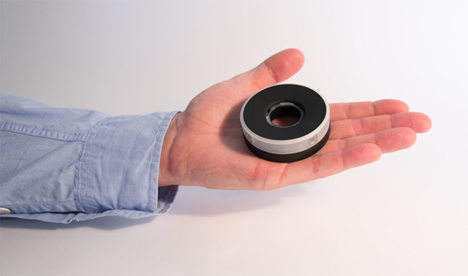 The CENTR is a small round panoramic camera that fits in the palm of your hand. When you go BASE jumping, mountain biking, hang gliding, or whatever your favorite sport happens to be, the CENTR records a 360-degree panoramic video. The video can capture the look on your face when you nail the landing on that crazy bike trail at the same time that it’s recording your friends behind you doing the same. The camera is, on its most basic level, four 1080p webcams in a circular case. But making those cameras work together to capture everything and make it into the perfect panorama required a lot of technological work. The lighting, alignment, colors and everything else captured by the cameras has to work together to look like one contiguous video. 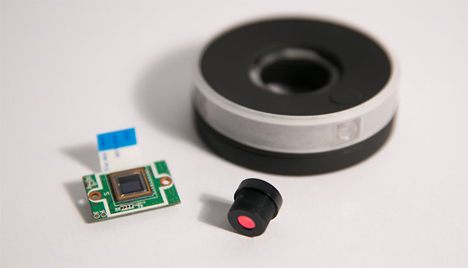 One of the considerations when designing the CENTR was how to get that perfect panoramic video without the user’s hand obscuring part of the picture. That’s where the donut-like design came in. You can either hold the camera on your thumb or attach a small tripod in the center – either way, you get a completely unobscured video. An 8GB internal drive holds the video files, or if you’re into instant sharing you can then stream on your phone, tablet, or laptop. The creators took the project to Kickstarter to bring this truly awesome project to life. As of the time of publication, the project hasn’t yet reached its $900,000 goal.